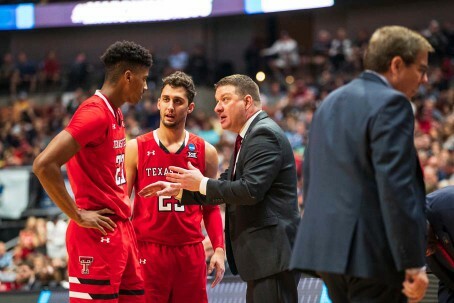 Chris Beard consistently talks about building a college basketball program that consistently competes for championships – and the Red Raiders are closer than they’ve ever been with the team’s first visit to the Final Four this weekend. Marlene Stollings — even in her first year of leading the Lady Raiders — is focused on winning Texas Tech’s second national championship. With the second best turnaround by a first-year head coach in the Power Five, she’s well on her way. And construction is underway on the facility where they will continue to build their programs. Across the street from United Supermarkets Arena, the Dustin R. Womble Basketball Center is beginning to take form. The almost $30-million project — another piece of The Campaign For Fearless Champions — is expected to open before the 2020-2021 basketball season. 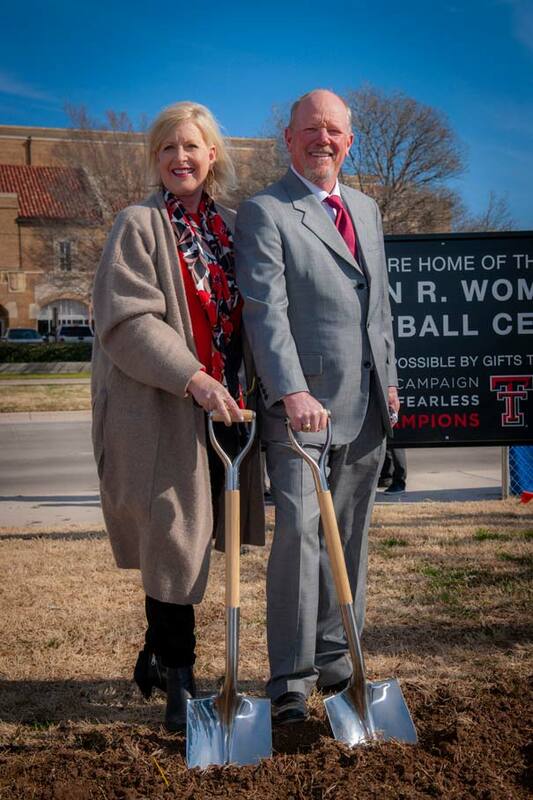 Dusty Womble, Texas Tech graduate and longtime Red Raider sports fan, donated $10 million to what will become the home for the men’s and women’s teams. Alumni and donors contributed the balance. 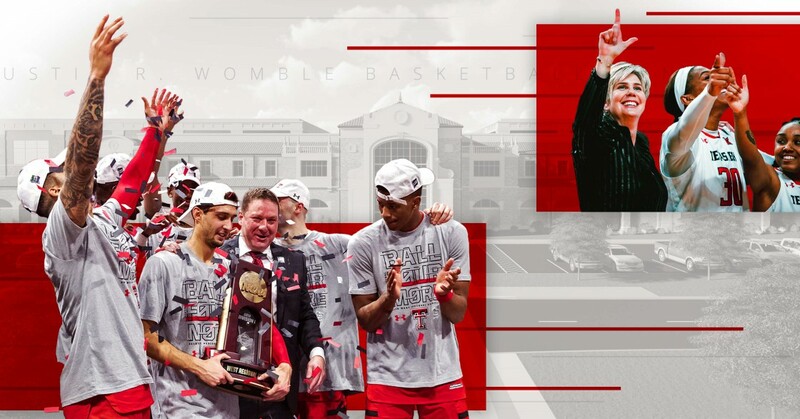 “This really was a necessity,” said Beard, who guided the Red Raiders to their first-ever Elite Eight in the NCAA Tournament last March and was named Big 12 Coach of the year for a second consecutive season. Dustin R. Womble, right, and his wife, Leisha, pose at the groundbreaking for the new basketball facility that bears their name on Jan. 25, 2019. Womble — who Beard calls humble — dished more praise to donors who contributed the rest of the $20 million. 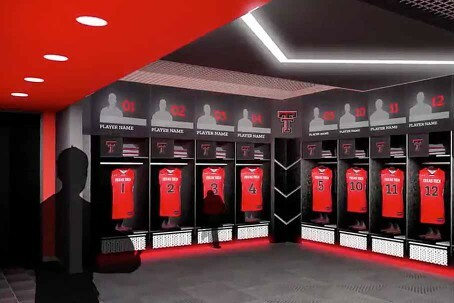 “Fellow Red Raiders stepped up in a big way over the last 12 months to make sure this project broke ground and got finished in a timely manner,” said the Lubbock businessman, who started his first business venture while he was still a Texas Tech student. Texas Gov. Gregg Abbott appointed Womble to the Texas Tech University System Board of Regents last month. Since announcing the project in late 2017, Texas Tech Director of Athletics Kirby Hocutt continued to refine the building’s plans, traveling with a group to study similar NBA and college facilities. “It’s important for us to develop young people — to develop a basketball player from the high school level, through college and on to their dreams of playing professionally. Strength and conditioning, training and nutritional counseling and services are such an integral part of that. And so we had the opportunity to expand those spaces within the Womble,” said Hocutt. 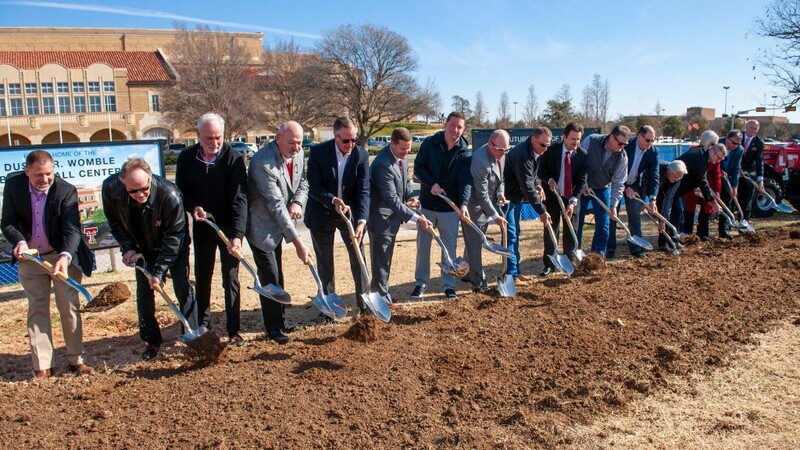 Texas Tech University System officials and donors break ground to start construction on the Dustin R. Womble Basketball Center during a ceremony on Jan. 25, 2019. Both Beard and Stollings agree the building will help on two levels — recruiting Texas Tech players and developing them while they’re here. “A top player in the country comes to Lubbock with his family and tours the facilities. 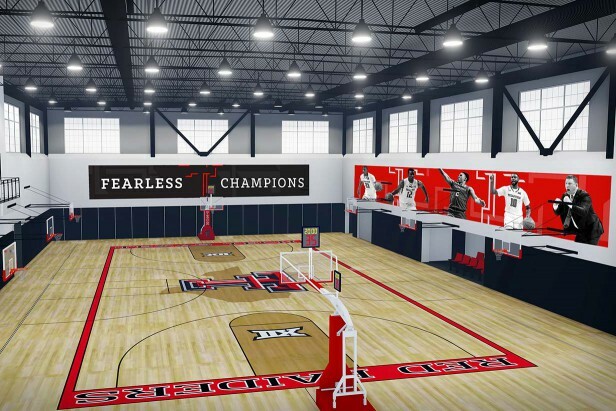 We walk across the street from the nicest arena in the country — United Supermarkets Arena — and now we’ll have this standalone NBA-type practice facility that’s going to help with recruiting,” said Beard. Top players want to go where they know the basketball program is 100 percent committed, supported, and funded, he added. “We’ve been showing recruits and their families the diagrams, the video and the plans — but now to see the fences go up and the ground broken, we’re hoping it’ll help even more,” said Beard, noting that along with the raucous home-game atmosphere, it’s one more thing his coaching staff have to attract recruits. When Stollings brings recruits on campus, she shows them the Lady Raider 1993 national championship trophy. Then she points out the arena’s west side windows, across Indiana Avenue to show the prospective student-athletes where their “home” will be. Stollings came to Lubbock after four seasons leading Minnesota’s Golden Gophers, who made the NCAA playoffs twice in her tenure. Facilities become more and more important, she said, with high schools creating better arenas and practice facilities. Players don’t want to take a step back when they go to the elite levels of college sports. 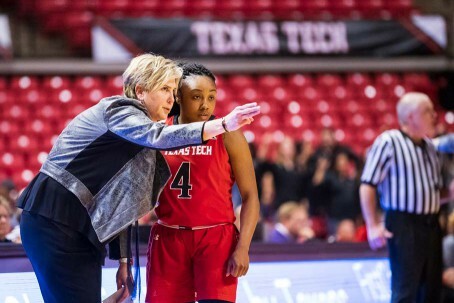 Lady Raiders Head Coach Marlene Stollings, left photo, coaches freshman guard Chrislyn Carr during Texas Tech's matchup against TCU on Feb. 6, 2019. Red Raiders head coach Chris Beard, right photo, discusses a play with sophomore guards Jarett Culver, left and Davide Moretti. Beard explained how the facility will be a one-stop shop for both teams. “If I need to go get some academic help, if I need to go to the training room, if I need to go to the weight room, if I need to watch some film, if I need to go get some extra shots up,” it’s all in one place, he said. The facility will be available 24/7/365. The Lady Raider coach is specifically excited about the sports medicine area where players can recover from injuries. “That separates us from the competition on some levels,” she said. The facility and other facilities from The Campaign For Fearless Champions also help recruit coaches. Stollings said the building plan was a bonus in her decision to take the Lady Raider job. An architect's rendering shows the refined design for the east side and main entry of the Dustin R. Womble Basketball Center. 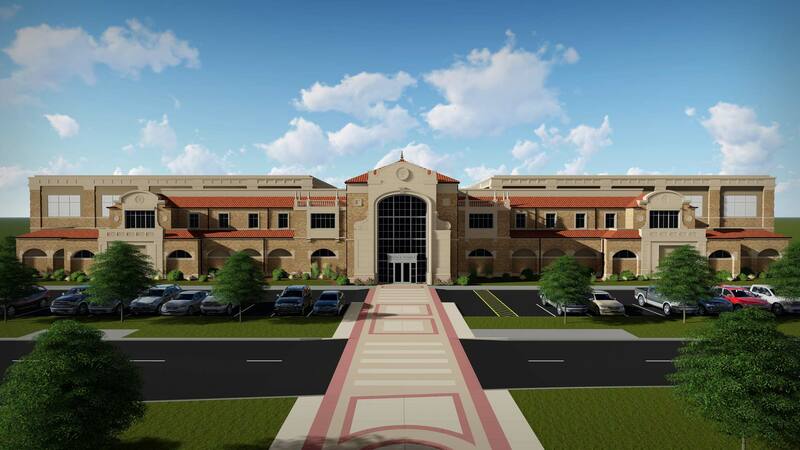 The building will be sited just west of the United Supermarkets Arena on the Texas Tech University campus. In the past year, Hocutt, Stollings and Beard made sure the Womble Basketball Center would meet the needs of both programs for years to come. The trio took the extra time to refine the design and think about the next decade. “When you build something like this, you anticipate the next change and give yourself a chance to be relative for a long time. We know it’s going to be the nicest facility in the country the day it’s built, but we want it to be really, really nice ten years from now,” said Beard. For example, space has been added to the strength and conditioning areas. An architect's rendering shows a team meeting room inside the Dustin R. Womble Basketball Center at Texas Tech University. 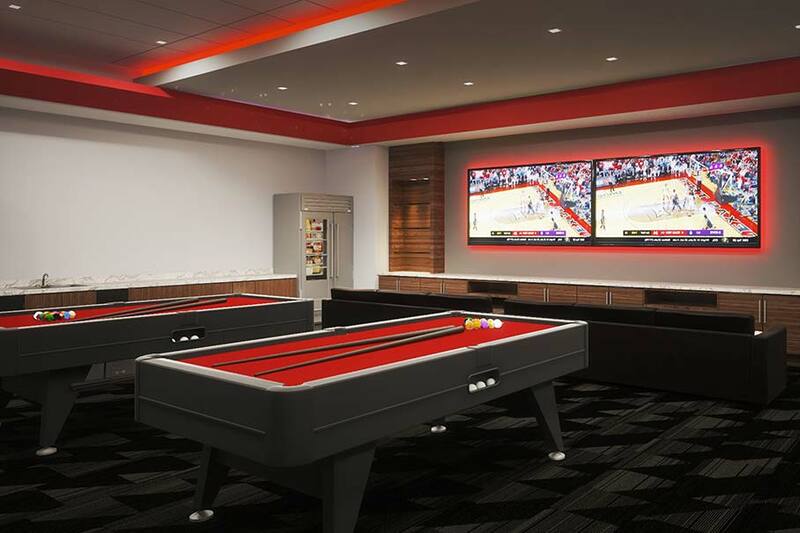 Concepts for the players' lounges include larger spaces and added amenities. The improvements came after some road trips. “We also spent a lot of time visiting with NBA people and visiting NBA facilities to make sure everything we are doing is on the curve — give our players every benefit to be great,” said Beard. “We saw what the Mavericks had done,” he said, before recounting visits to see where the Oklahoma City Thunder, Miami Heat and Memphis Grizzlies train. They also visited about a dozen college practice facilities. 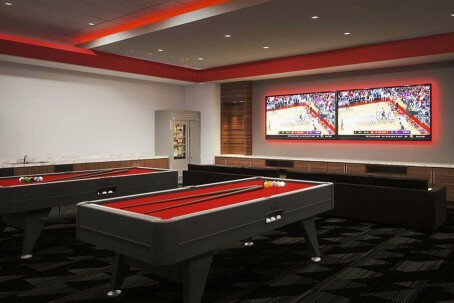 In addition to rethinking the sports medicine and strength and conditioning areas, the group enlarged the players’ lounges, added amenities and upgraded the dining facilities. 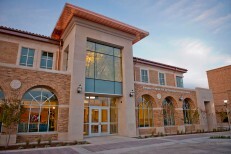 Equally important were the finishing details, making sure the building reflected the Texas Tech culture inside and out. More features were added to the exterior of the building to capture the Spanish Renaissance Revival architecture that has become the campus’ signature. 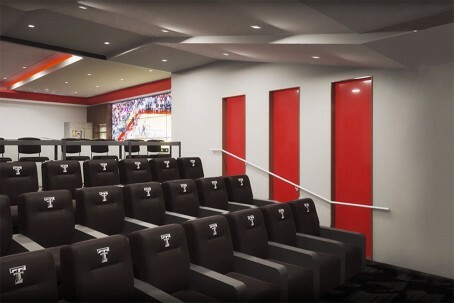 Inside, graphics, displays and furnishings reflect the determination and grit of the up-and-coming programs replete with plenty of Double T logos and lots of red and black. 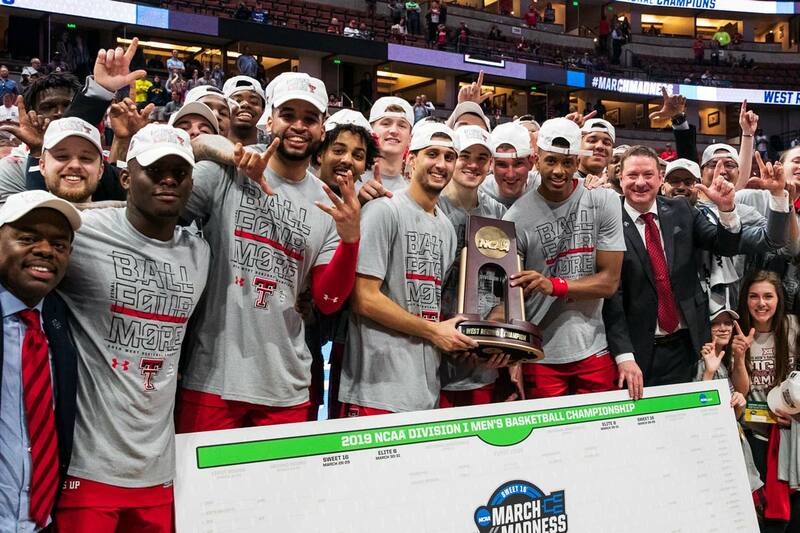 Fundraising got a boost from Texas Tech’s historic run to the Elite Eight last season. “Without a doubt, it has accelerated the project,” Hocutt said. But the idea started well before Hocutt hired Beard. And Beard goes further back when he talks about support for Red Raider hoops. Names like Marsha Sharp, Sheryl Swoopes and Carolyn Thompson set the bar for women’s basketball. The trio were inducted to this year’s inaugural Ring of Honor class along with men’s basketball greats Rick Bullock, Andre Emmett, Dub Mailaise and Jim Reed. Their names now adorn the inside of United Supermarkets Arena, reminders of the rich legacy of Texas Tech basketball. Beard cherishes Texas Tech’s sports history with the same enthusiasm he holds for its future. “We’re just kind of awakening the giant. We’re not doing things that haven’t been done before. We all understand that tradition back in the day at the old Lubbock Municipal Coliseum when people waited in line, couldn’t get in the building and the overflow went into the auditorium,” he said. And his ambition for Texas Tech basketball doesn’t stop at the turnstile. “I was here during the Coach Knight days where we had great attendance and we went to three NCAA Tournaments in four years and a Sweet 16,” said Beard. Besides this year’s team getting to the Final Four, they were the Big 12 regular season champs and cut down the nets after winning the West Region in Anaheim to get to college basketball’s biggest stage. “We’ve been fortunate to have the generous support from thousands of Red Raiders who have allowed us to continue to move the ball forward,” Hocutt said. Philanthropy has been a critical driver for the project — one of 28 ambitious projects funded by The Campaign for Fearless Champions. Hocutt announced the fundraising effort in 2014 with a goal of enhancing athletic facilities, investing in student-athlete scholarship endowments and growing the first-of-its-kind J.T. & Margaret Talkington Leadership Academy. Team locker rooms, above, and other amenities including sports medicine and strength and conditioning spaces are part of plans for the Dustin R. Womble Basketball Center. The need for a basketball practice facility resonated with donors. Among them, Jerry S. Rawls, co-founder and chairman of Finisar, who supported the project. Perhaps best known for his gift to endow the Rawls College of Business at Texas Tech University, Rawls also funded the construction of a masterpiece golf course and has continued to support Texas Tech golf, football and basketball. “His influence on our student-athletes reaches far beyond wins and losses. His investment in these young men and women impact their lives,” Hocutt said. The men's practice court inside the Dustin R. Womble Basketball Center will be named in honor of longtime supporter Jay Crofoot. The men’s practice court inside the facility will be named the Jay Crofoot Court to honor the Crofoot family’s generosity. Other significant donors included Lubbock developer George and Linda McMahan, Lubbock real estate firm Madera Residential and the family of the late Raymond Pickering and his widow Lucille. While donors are essential to propelling both programs forward — there are plenty of other ways to support the basketball teams. Coming to games, for example. The teams that regularly compete for national championships have reliably sold-out arenas. “I’m so appreciative and thankful for the people who do come,” said Beard, realizing that students and fans have a lot of commitments and it takes time to show up for close to two-dozen home games a season. 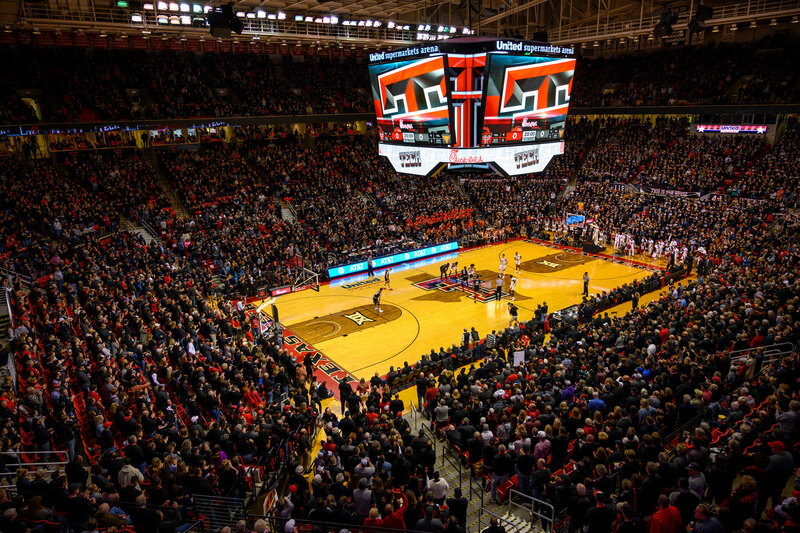 A capacity crowd cheers on the Texas Tech Red Raiders during the final home game against Texas at United Supermarkets Arena on March 4. Fan support is critical as the team builds to the next level. “We’ve proven we’re good enough to compete but can we be consistent? Every player on our team has proven they’re good enough to play at this level — but can they be consistent?” he said. “If we can start doing it in back-to-back games, back-to-back weeks, back-to-back months, then it turns into back-to-back seasons and then you become relevant nationally,” he said. Following up a first-ever Elite Eight finish with a repeat appearance last week, certainly bears out Beard’s mantra of consistency. Just as he expects from more his players, Beard wants to see fan support to rise to another level, too. “I see a lot of similarities in our fan base and attendance. Everyone in college basketball knows when Kansas or Texas rolls in here the Red Raider Nation and our student body is second to none. It’s one of the best atmospheres in college sports. But the next level of really competing for championships is to be consistent. Can we have a crowd in November that’s as advantageous when we play Texas in February?” he said. Beard knows the team has to continue to perform at a high level and build relationships around Lubbock and the South Plains to help encourage fan support all season. When asked how the groundbreaking for the Womble Basketball Center fits into the momentum surrounding his team, Beard doesn’t miss a beat. It’s a consequential statement from someone so steeped in the program’s history. His next words blew it away. The Texas Tech men's basketball team and coaching staff pose with the West Regional trophy after advancing to the Final Four on Mar. 30, 2019.